Green Tree Borough Welcomes You! Click here for bid information for proposals for Lane-Use Control System Upgrades on Greentree Road. 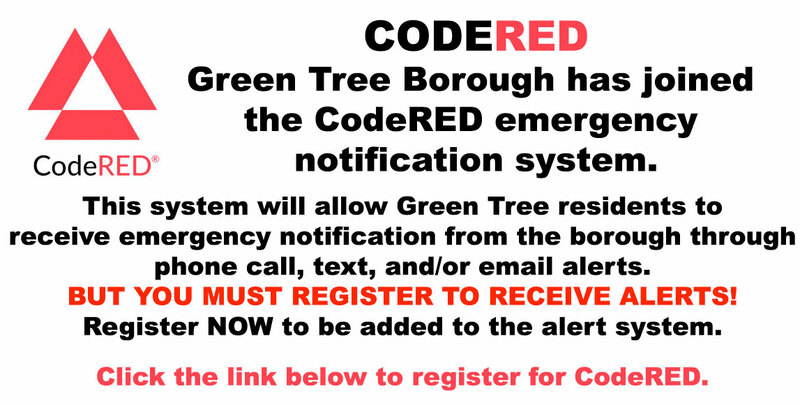 Click here to register for CodeRED. Click here for times and locations of these events. Green Tree Borough Council will meet next on Mon., May 6 at 7:30 p.m. in the Sycamore Room of the Green Tree Municipal Center. Click here to register for weekly email updates regarding Green Tree news and events. Click here to download a Snapology registration form. Click here to register for the Rain Barrel Workshop. Be sure to register for the Green Tree location.